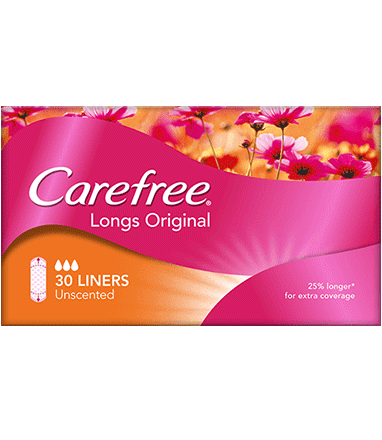 Change your liner without changing your undies with CAREFREE® Original Long Unscented Liners. They’re 25% longer* to provide you with extra coverage if you’re experiencing heavier discharge or spotting. They are designed with a textured moisture proof backing to give you extra protection and the wide adhesive strips help keep the liner securely in place. A drop absorbency rating of 3 means they are suitable for moderate to heavy discharge/spotting and are also ideal as a tampon backup. *vs CAREFREE® ACTI-FRESH® and CAREFREE® BARELY THERE® Liners.